I still consider myself to be very much a newbie when it comes to WordPress, even after completing the Udemy course which I blogged about here. What a wonderful surprise! A good friend messaged me earlier in the week to check my address and let me know he was posting something up to me. 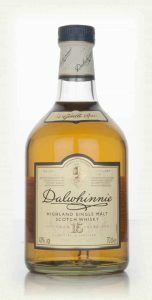 It arrived this morning and was a bottle of Dalwhinnie 15-Year-Old Whisky. Do surprises get any better? I’ll let you know once I’ve had a dram this evening…. Another to add to my current whisky collection, which I blogged about here. After my last post, I realised the next one would be my 50th, so thought I’d commemorate it with its own dedicated post! I mentioned this course in an earlier blog, but finally got it finished this week! I really like the idea of Udemy, which provides online access to hundreds of really good training courses covering a wide range of subjects. They’re pretty good value for money too – I think this WordPress course cost £15. I thought I’d published this blog, but I’d only saved as a draft, so in terms of a timeline, I actually wrote this before I moved my blog from web to WordPress. It’s only relevant regarding the FreeBSD 9 EOL, as the problems described below had been learned before creating my WordPress jail, hence the reason it wasn’t mentioned! Well, as my SSL certificate from an earlier blog was coming up for expiry later this month I thought I better have a go at setting up certbot on my Nginx-proxy server, so I don’t have to mess around creating a cert manually and copying it across to the server.